Delicious Red Macaroni and Cheese – Just 3 Ingredients! 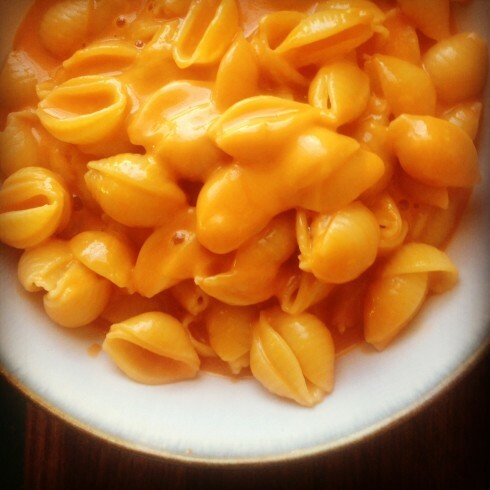 I grew up eating Red Macaroni and Cheese and thought it was completely normal. When I went to college, I realized no one else had ever heard of it. For the last several years, I haven’t eaten much macaroni and cheese in any format, but while I’m pregnant, it is the perfect combination of carbs and cheesiness to make me feel amazing. Of course, when I’m not needing the extra carbs, I use cauliflower or zucchini pasta instead and it’s still amazing! I had a vegan friend make it with vegan cheese and another friend make it with almond cheese—both worked and they loved it! Please make this—it’s easy and delicious! 4-6oz sharp cheddar cheese (shredded, cubed, or sliced) – I always check here first for my fave cheeses! Cook the pasta. In a different pan, heat the tomato soup on medium and add the cheddar cheese. Stir occasionally till the cheese melts. Drain and rinse the cooked pasta, and then dump it into the tomato soup cheese mixture. Mix well, and serve. This should serve 4 people, but sometimes in my house it serves 2. Please note that this recipe is not an exact science—it’s one of those examples of when I asked my mom how much of each ingredient she uses, she couldn’t really tell me. She never measures (but when you use a can of tomato soup it’s generally 14.5 oz or close to it, so I started with that and experimented with the other two ingredients). If you want it thicker, then add more cheese, etc. The only thing you can’t do is reduce the amount of pasta once you’ve dumped it in, so you may want to cook a little extra pasta and leave some aside until you decide if you want/need it added. Everybody loves this stuff! My college roommates always used to ask me to make it for them, along with my grandma’s apple crisp. But that’s a recipe for another day! It’s interesting to me how everyone seems to love macaroni and cheese, yet, it’s often so bland when made from a recipe (we won’t even talk about the boxed stuff!). My Mom has another amazing mac and cheese recipe, but there are so many steps involved and about 8 different kinds of cheese… admittedly, it’s awesome, but it’s so much work that I just stick with this one. I like it just as much as the fancy kind! When I was a kid, we often had this with hot dogs and then some kind of vegetable (like broccoli or peas). As if that made it a healthy meal or something. Ha. But really, I’m all about splurging once in a while, and there aren’t many things as comforting and yummy as mac and cheese! Have you ever heard of red mac and cheese? Previous post: Amazing and Easy Holiday Pesto Dip! Next post: 9 Easy Ways to Eat Liver… and Enjoy It!